It’s almost noon on Thursday here in Johannesburg. I just got checked into my guesthouse — the Melville Manor. Melville is a beautiful little neighborhood north of the city center. My guesthouse is just steps from little art shops and a cafe — the cafe is where I’m writing from. It’s a beautiful day here — about 65 degrees, bright sun, light breeze, low humidity. I’m going to make this short, as my body is a bit worn from the night-long flight from Frankfurt that traversed the entire length of Africa. From across the Mediterranean Sea, our plane passed over Libya, Congo, Zambia, and finally Botswana (Allison, did you see me wave?) before crossing south into S. Africa. The air was rough over the entire continent — as though the land was heaving sighs at the plane, a bit disgusted by the disruption of the metal concoction hurling overhead. I had wished to rest overhead each cloud peak — to ponder each mile over which I traveled. Instead I happily envisioned all the beautiful creatures below — imagining that a few may have gazed skyward just in time to notice the little star that moved. When you’re a tourist (uck) in Johannesburg trying to fill a few days before moving on, most guidebooks and locals will tell you that Soweto is among J’burg’s “must see” areas. Soweto is the town where both Nelson Mandella and Desmond Tutu have lived, and is the largest black community in all of S. Africa (1.5 million+). Within its environs is one of S. Africa’s poorest settlements – and what has to be one of the world’s most moving places. My immediate reaction was that these residents, who live in some of the worst squalor on earth, have probably been taught to extend such welcomes to tourists — part of some promise made that with friendliness comes more tourists, and more money. Not two steps beyond the fence, three little children — 2 boys, 1 girl — orbited around us. They waited patiently while our guide began to explain Soweto to us. I wasn’t listening. All I could see was these children. The little girl, no more than 2, was crouching on the ground picking up rocks and litter. The two little boys were wrestling a bit — arguing over something. Then the little girl stood up and turned around with something in her hand — I guessed she had found something on the ground to play with. She turned around, and on the tip of her tiny finger twirled a filthy condom (unused, thankfully). The guide kept talking. The sun kept shining. Life went on around us, as this 2 year old little girl played with a condom she found in the mud. When we entered the area, I had grabbed my camera. But upon seeing this little girl, I immediately put it away. I refused to make photos of this desperation part of my vacation scrapbook — I couldn’t bare the thought of being so intrusive, and collecting such a troubling image just for show. I imagine if I had, it would have been the only souvenir worth sharing with anyone from this trip. It was one of the little boys, walking at my left as we strolled on through the village. He started patting my leg. I looked down, tried to smile and said hello. Again, I imagined this little boy had been trained to do this. When you arrive at this area, the children are queued up, waiting to accompany the tourists on their walk. We were then led into a “house” — concrete floor, corrugated metal roof and walls. There was a woman. We were told this was “an example” of a home here — in this one, five people lived. Her family had lived in that house for 11 years. There was a single bed covered in clothes, a stove, and a table. The thousands who live like this share 5 common taps for water, and about 50 portable toilets. He was back at my side for the walk back to the lot where the artisans and the tour company vans were. Only a few hours before, another man offered me a piece of beadwork of a thinking man, and said the very same thing. The second time, from this man living here, I wasn’t as well armed to refuse — and with a broken heart, tears welled up in my eyes, and shame, I pulled wrinkly money from my pocket. After I paid him about $12 for the sculpture, he muttered something I couldn’t quite understand. I leaned in closer. I could not really think of anything to say then, or for the rest of the tour into the other less compelling parts of Soweto. I’ve been struggling with whether that part of Soweto belongs on a tour. On the one hand, tours do bring money and exposure to these people. I recognize the value of having people, like me, whose lives are comparatively privileged SEE this part of life. It changes you — if it doesn’t, you’re empty inside. But I also felt like these people were being exploited — that is was tantamount to a zoo exhibition…the poor on display for the profit of tour companies. My guess is that the animals in the J’burg Zoo enjoy a more peaceful, content existence than many of Soweto’s poorest. I returned to Melville tired, heartsick, and cozy. With nothing left in my life to ever, ever complain about. Tomorrow I leave for Klipkop to start my volunteer assignment for two weeks. I’m looking forward to getting out of the city, closer to the animals, and healing from what I saw yesterday. I know this doesn’t sound like a very enjoyable vacation to most people. Few of my vacations ever have. Vacations to me are not about rest and relaxation — they are to challenge me. To give me new things to think about, and new experiences to learn from. In just a few hours, Soweto gave me all of those things. Despite her poverty, her gift to me was bountiful and, in its own way, beautiful. If I can home today, my life would never be the same. Hello from Klipkop. I arrived here Sunday afternoon. The reserve is located about an hour to the n.e. of Johannesburg. Along the way, we passed more squatter camps (a la that of Soweto) – one where young boys were playing soccer on a clay dirt field, running, leaping and laughing. I am here with about 12 other volunteers – from Scotland, Great Britain, Canada & Australia. Most of the volunteers are in their early 20s, with a few of us “older” people. Like people everywhere, some are friendly, some are a bit aloof. But altogether, it’s generally a nice lot. The Klipkop property is in an arid, slightly hilly region. The hillsides are beautiful, with varieties of long grasses carpeting the horizon, beneath short scrubby trees. The night sky is incredible, with so many big purply stars that there’s scarce room for darkness. On Monday, I went through a half-day orientation that just described the property and the methods of management used to try to restore the area for wildlife. I’ve seen a few critters, but am at a loss now for their names – nothing exotic yet, although there are wildebeest and zebra around I’ve heard. Apparently, on my walk back to the house this morning, a small herd of wildebeest passed directly between me and two ladies who were walking about 50 yards behind me. My eyes just aren’t keen yet. The house and property are comfortable. I share a room with three other men. They’re all quiet and no one snores, so sleeping hasn’t been an issue. We’re away from our room all day, so the cramped quarters haven’t posed any problems. For the past two days, we’ve hiked about 30 minutes up to the top of a hill where the small animal and bird rehabilitation center is. There are about 50 or so birds, and a few small critters there, including a bushbaby who is very cute with big orange eyes and tiny little hands. Yesterday we spent more than half the day cleaning cages and feeding. Today we just cleaned dishes and fed them. One nice facet of this particular project site is the flexibility. On Monday night, a small group of us drove into Pretoria to see a movie (“Troy” – don’t bother). This weekend, I’m going to go on a 3-day excursion to Kruger National Park (S. Africa’s largest nat’l park) along with two ladies – Rebecca, who works at the Perth Zoo in Australia, and Beth, a 50-ish pharmacist who is also a breast cancer survivor and a really inspiring person. The three of us have clicked since we all arrived together. We’ll be spending the night at one of Kruger’s camps, then going on wildlife excursions during the day and perhaps even at night. There we hope to see lion, rhino, hippo, etc. I’m really looking forward to it – for, as beautiful as Klipkop is, it’s not particularly rich in wildlife. That’s part of the project here – to return the farmland to nature. I’m still contemplating what to do with my last 9 days in S. Africa after my assignment ends at Klipkop. One option is to pair up with Rebecca to travel into Botswana and on to Zimbabwe to see Victoria Falls. She is already signed up for an overland tour that begins in J’burg and ends at Victoria Falls a week later. We would pass through the delta in Botswana, float down rivers in dugout canoes, see some incredible countryside, and – finally – spend a few days at Victoria Falls. I’m also contemplating some more travel on my own around S. Africa. Thanks for all of your heartfelt responses and well wishes. Although half a world away, I still share your sky and wish Africa’s warm bright blue above you all. Yesterday, we arrived back at Klipkop after spending three days at Kruger National Park. On Friday, we drove west from Klipkop through the countryside toward Kruger. Within an hour or the park, we spotted a roadside marketplace which was located just beyond miles of citrus orchards. Needing food for our stay, we pulled into the roadside area and were practically cheered by the people tending the stands – each smiling and waving us towards their racks of oranges, avocados, bananas and hand crafts. With three of us, we tried to spread our patronage around – each of us buying from a different seller. I suspect it’s perfectly acceptable to negotiate prices at such places, but the prices were already so low that none of us felt compelled to strive for a better deal. It was just such a genuine pleasure passing money for goods with the ladies tending the stalls. In one case, Rebecca refused change for a bag of oranges (the change would have been less than $1), and the lady – wrapped in bright colors from head to toe – painted Rebecca with a hug and giggled with joy. Few are the opportunities to touch someone and have such a gracious response for a dollar. It was beautiful. We arrived at Kruger mid-afternoon, and had a couple of hours travel time before finding our camp facilities. We paid our entrance fees and began the drive toward our accommodation. Within two minutes, we stopped the car to watch a small herd of impala grazing to our left. Little did we know at the time that impala are EVERYWHERE in the park – but for Westerners, the impala is still an “exotic” species….so we sat and enjoyed watching them. As I looked through my camera lens at them, I noticed movement in grey to the right and lost my breath when I saw it was a huge elephant wallowing in mud and splashing water on itself. He was gorgeous, with bright white tusks shining against his grey body that was painted charcoal from the mud. I could barely catch my breath to tell my companions. We must have sat there for five minutes, and the elephant became curious and began moving closer to us. His movement looked like slow motion, and it was as though every branch or blade of grass that brushed against his body joined his time – moving slowly against his thick leathery skin – slowing down with him. We drove on reluctantly. We couldn’t bring ourselves to drive more than 20 mph through the park, each of our heads on a pivot – searching for more life. Kruger is a huge park, with variances in topography from south to north. The southern part is brush, with lots of small trees and scrub land. We arrived at Skukuza camp near sundown. I might just say here that the entire park makes the facilities at our national parks system look filthy. Everything – every road, every restroom, every sign, every guide truck – is immaculate. You can tell there is a great deal of pride in taking care of the park – it shows everywhere. At these observations I was able to share with Beth and Rebecca the lackluster care that our beautiful parks in Colorado get – beer cans in streams, trash left at campsites, graffiti on rock walls. Kruger looks as though it’s scrubbed clean every morning. Skukuza is one of about 8 or so little camping stops within the boundaries of the park. It is one of the largest ones, and is fenced off to keep animals out. Our bungalow was made of concrete, with a pitched thatch roof. It was very nice, with an outdoor kitchen, and located in a little cul-de-sac. By the time we unpacked, we were road weary and ready to just relax. We unpacked, shopped for groceries at the little commissary, then had dinner at the camp restaurant. By the time we returned to the bungalow, it was dark, and the milky way was in full elaborate view. It looked like every night sky that has ever been, carefully merged into one. I put a blanket down in the grassy area in front of our bungalow, and stared up at the stars for more than an hour. Quietly. Rebecca joined me and we just lay there – speaking only to acknowledge how small we are. Single file, warthogs with four babies walking down the road, as if off to church or something. Saturday night we signed up for a night drive through the park – apparently after dark is the best time to try to spot some of the big cats. We drove away from camp just as the sun set, and then watched the night sky appear again as if operated by some grand dimmer switch. We did not see much on the drive, but we did see a leopard as he climbed up through the bush. Despite the few sightings, it was nice to be out in the chilly night and smell the open air. The following morning, we joined a sunrise walk – our first opportunity to actually set foot inside the park. Otherwise you are not allowed out of your vehicle (for obvious reasons). We were accompanied by two armed guides for safety, and drove out to a wilderness area that is protected much the same way wilderness areas in the US are. It’s land set aside just for nature – no roads, facilities, or access. As we approached our starting off point, we saw a male lion within 20 yards of our vehicle. He was limping – perhaps injured in a fight. We walked single file through the bush, not uttering a word so as to not scare away any animals we might want to see. It was a clear quiet morning, with nothing to hear accept birds and far off cries of elephants. We rested after about an hour on foot, and I found myself a spot amid a myriad of animal tracks impressed in pumice-fine sand. I faced north, with the morning sun warming the ground around me, and just listened for what I could hear. It was a peaceful few minutes – a beautiful time to just share that small space with those who had walked across the sand before me. As I sat there, I didn’t know what amazed me more – that such a place exists, or that I was a part of it. We returned to Skukuza later that morning – having seen the lion and a hyena during the drive and walk. We made breakfast and planned our day. Beth decided to stay around camp while Rebecca and I took the car out again to travel to the northern part of the park. 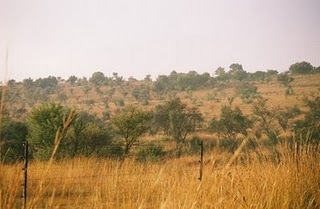 The topography changes from south to north – from scrubland, to more hilly high savanna. 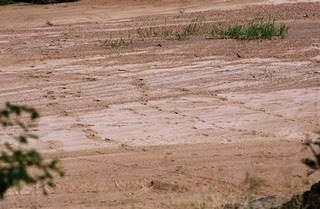 During the drive we saw giraffe, tons more monkeys, and a lone elephant walking down a dry river bed. At one point, we took a side gravel road off the main path to try to find rhino. The loop took us near a river, and we stopped the car and shut off the engine. We sat quietly just listening – it’s one of the best reasons to go to such a place. The savanna is an extraordinary place to just listen. The grass moves like conductor’s hands, whispering things to birds on trees that look like bonsai whose wish came true. On our way back to Skukuzu, we spotted two lions from afar. They were hunting, and thus still. So they were a bit hard to make out – but not so much so that we were most willing to spend 45 minutes just watching for movement. When we got back to our bungalow, Rebecca took a nap and I took the car back out to capture a picture off the sunset. The gates to Skukuzu close at 5:30, and the sunsets at about 5:20 – so I had to find my spot with little time to spare for a return. I found the spot at the crest of a hill, overlooking the park and the mountains that make up part of its western border. It was full of flame as it snuck behind the mountain range, and almost winked at me before my rotation sped me away from her. For one second, the sun was a bright orange tear perched on a clear purple plane. We left Kruger yesterday morning (Monday) and had planned to dip down into Swaziland on our return trip. On our way out, we finally saw a rhino. We also saw a herd of zebra with babies. I got a few pictures of one of the babies nursing. The border crossing was about 40 minutes south of the southern park gate. As we drove south, the landscape became increasingly hilly and reminded me of the drive across the foothills in Colorado. We arrived at the border crossing only to find that we couldn’t cross because Rebecca did not have her passport with her. But Beth and I got our passports stamped and crossed just for the novelty. We had lunch there, and then backtracked toward the park and then west toward Klipkop. As we drew nearer “home”, we noticed the lowlands blanketed in smoke. It looked like there must be a large grass fire that was covering all low lying areas with thick smog. This was the case in several places – not just one, like you might suspect from a grass fire. We finally figured it out – the smoke was from the shanty towns. It was people cooking and heating their homes – covering their townships with so much smoke that you couldn’t see the anything below it. We finally arrived safely back at Klipkop last night, and shared our stories with the other volunteers as we sat around a fire. That journey to Kruger was worth crossing the ocean for. There is nothing I can write here that can impress upon you how incredible it was to see those beautiful creatures at home. It was moving beyond my feeble words. My assignment here at Klipkop ends on Saturday, and I’ll be joining up with the tour that Rebecca is on that travels north into Botswana and the Okavango Delta, then on to Victoria Falls. We’ll be camping at night, and going on day excursions. Then I’ll fly back to J’burg from Victoria Falls a week later to travel home. I’m looking forward to seeing as much of Africa as I can, so I’m excited about the tour. I’ll leave Klipkop today. Rebecca and I will travel back to J’burg and stay at a hostel before leaving on our tour through Botswana tomorrow. My time here has been nice. I haven’t found the work quite as rewarding as I had hoped in terms of working with a greater variety of animals. There are also little things like crummy food (and very little of it) that have also affected my stay, but amid the pains and disappointments, there have been extraordinary moments that have proven all the rest well worth the stay. A few days ago, I hiked up to the top of Klipkop Hill with James, a fellow volunteer who just graduated from Oxford with a degree in physics. We sat atop the hill until just before sunset. The view of the veld was really brilliant, as all the tall grass turned pink in the evening light. We hiked back a different route that took us through the grass that almost reached our heads. It reminded me of the scene in “Gladiator” where all you see is his hand brushing across his fields. Last night, a group of us camped out in the middle of the veld. Before climbing into my sleeping back, I strolled away from the group to find a quiet spot of still-warm ground and laid down to stare at the night sky one last time from Klipkop. There were beautiful pillbox cotton clouds strung across the sky shrouding the moonlight, and it cast a pewter light on the ground around me. I could smell the campfire, and hear the murmurs of the rest of the group, and wound up being lulled to sleep there in the tall grass. I did finally wake up and make it back to camp. I didn’t sleep very well, but it’s just as well – I woke up at about 3 a.m. to stir the fire again and got to experience about 10 minutes of solitude with just the fire, the moon, and the jackals that were singing over the hill. And I got to watch the sun rise over Klipkop from the warmth of my sleeping bag. I don’t know what my access to email will be while on the tour, so you might not hear anything from me for a week or so. I’ll probably send at least one more email sometime after we arrive at Victoria Falls next Friday. I hope everyone is well. It’s Sunday afternoon and I’m a few hours from catching my flight back through Frankfurt and finally home. My body is skinny, brown, and worn. Just today, I arrived back in J’burg from Victoria Falls Zimbabwe. A week ago, we set out on our tour that took us up into Botswana. It was an absolutely incredible and moving experience that I know I don’t have words to describe….but I’ll do my best. We left J’Burg a week ago along with a couple from England, a man from Australia, and a young man from Los Angeles — just six of us on a tour that can accommodate 24. We traveled by way of a converted military personnel vehicle — a very bumpy ride, but roomy with so few of us. Our first day, we drove all day long to reach the border crossing in Botswana, then camped just across the border in tents and cooked food on a grill. The next day, was another long day of travel — taking us across the corner of the Kalahari desert…a beautifully stark landscape with Zulu families dotting the landscape and sandstorms kicking up on the horizon. That night (Tuesday), we arrived at a campsite near the Okavango Delta where we spent a total of four nights. Two of those nights were spent at a rugged camp right on the banks of the delta. We had about six bushmen along with us who had transported us to the remote spot by dugout canoe. The trip through the delta was breathtaking, and our two nights there were nothing short of life changing. We took morning and afternoon walks, cooked over an open fire, napped, and just enjoyed the view. 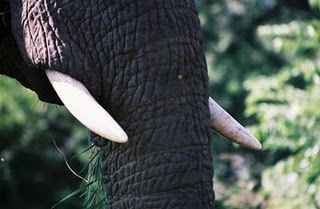 On one of our walks, we found ourselves encircled by elephants — a bit of a stressful situation, but also one of those times where your vulnerability to nature is a bit intoxicating. We watched the sunsets and moonrises, got our feet tickled by hippo grass, swam in the pure delta stream, and overheard songs and conversations in Setswana from our guides. On our last night, we cooked dinner for our guides and shared wine and chocolate with them. Then we listened to them sing and dance. The driver of our truck brought a guitar that he had just bought, and I was compelled to play there by the fire. As I played, more of the bushmen arrived off the delta, saying they had heard the music and wanted to come share in it by the fire. It was a magical experience to be sitting there, around a fire, on the Okavango, playing for those beautiful souls. The sand of the delta is thick and deep — and it felt like walking through ashes. It was a different experience seeing wildlife there, because it was really open nature — no park boundaries to keep the animals within a certain range. So while we had seen elephants and giraffe before, there was something special about seeing them there. We spotted a herd of giraffe running across a open range — gracefully dipping their brows with each stride, their patterns glowing bronze in the early evening light. So beautiful, so peaceful, so brilliant. The sunsets of the delta turned the sky champagne, and the sounds were so vivid I felt like I had just discovered sound. We heard elephants crashing through trees, birds singing, wind through grass, and little critters scurrying everywhere. There’s a bird here called the Lilac Breasted Roller — it’s beautiful with blue, pink and purple on grey and white and black…it looks like it was smudged on a sunrise, and it’s been wonderful company all along our journey. Like little guardian angels…. The moon was so bright that you could see almost well enough to read. Everything got cast into a thick violet light, and the stars reflected on the gentle currents. After our two nights on the water, we spent one more night at a campsite near the delta before driving on toward Chobe. We arrive at Chobe on Friday, and took a pontoon wildlife viewing ride around the water. Our first spotting was a young hippo that went running from the bushes into the water with a great big crash…it was so funny to watch a little hippo run. It reminded me of an excited little fat kid rushing from the car to the surf. We wound up seeing more hippos than I could count, and at one point we had about 12 hippos in front of us, and two young male elephants behind us. The highlight was seeing two lionesses on the shore, settling down to watch the sunset. I think I got a photo of them touching noses before a tour group in a truck scared them off. They were the most beautiful thing I’ve ever seen. Yesterday morning, we left Chobe and arrived at Victoria Falls in the mid afternoon. We had just enough time to walk to the falls before checking in our hotel and having my farewell dinner last night. The falls were massive, and sprayed mist so high that a full rainbow was formed along the viewing walk. This morning, Rebecca and I went skydiving over Victoria Falls…THAT was fun! With much sadness, Rebecca and I said goodbye after our skydiving. She’ll stay in Zimbabwe for a few more days, then continue her tour up into Europe for a few weeks before returning home to Australia. We had such a wonderful time traveling together and sharing our time in Africa. I’m fortunate for my life to have brushed against hers for just a short while here, and fortunate to have been blessed with the shared experiences that we’ll be able to recount via email when we crave Africa. My heart is so full right now. I’m sad to leave this place. I have been so moved, and made full by so much of what I’ve experienced. I wish I could tear off little pieces of it and give one to each of you. This has been so profound, there’s no way for me to adequately put into words how I feel. I know I’ll cry when my plane lifts off from Johannesburg…well, it probably won’t take that long. I will forever be changed by my Africa. I so wanted her to beg me to stay…but the sun is getting ready to set, my body is tired, my heart too-full. It’s time to go home…..